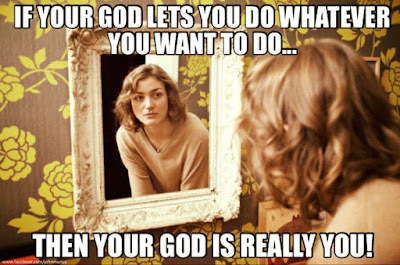 There is only one God and it’s not you! There are many “truths” in life. Even so, there are people who do not care about what is true, right and moral. Honesty, integrity, and conscience are empty, meaningless words, to many people in the world today. This is due to the simple fact that we have populated this planet to the point that, there are so many people, we can hide in the crowd. We can blend right in and no one notices us unless we make a special effort to be noticed. This also allows for people to “act out” in ways that would have stood out – “like a sore thumb” – in the past; and was frowned upon by the majority. This type of mentality (worldview) always destroys people and societies at the very core of their being. It is more destructive than any and all natural disasters. People can and do recover from “natural” disasters, but there is no recovery from selfish, self-centered motives; because there is no hope, no future, in such motives. Such motives can only consume until there is absolutely nothing left. This is TRUTH. This is immutable truth — even though there are those who hope and pray (pun intended) that it isn’t true. Truth cannot be done away with or ignored. The best anyone can do is to convince themselves as best they can that the Truth is irrelevant to them. Claiming that religion is the root of all evil in the world is a form of denial. People will always fight among themselves over something. Doing away with all religions is only taking away the excuse that people fight simply because of their religious beliefs. People fight because they are selfish and greedy. Using the name of God as an excuse for practicing evil is just that — an excuse. Mankind doesn’t need an excuse. Excuses are simply justifications and rationalizations for bad behavior. Behavior that is completely devoid of THE PRESENCE OF GOD in one’s heart and life. Defining God to suit our desires (such as the “I’m spiritual, not religious” mindset) is simply a form of denial. One cannot will their way out of bad behavior. Self-discipline is good, but it doesn’t go far enough. Our hearts are far too dark to maintain a genuine selfless and compassionate attitude toward all people, under all circumstances. No matter how good we try to be by our own volition, our intrinsic nature will never change. Consider this; even when Christ was walking on this earth, performing miracles and speaking the very words His Father (God) was giving him to speak, people still sought to deny the Truth that he was the Son of God. People acknowledged that Christ spoke with authority; unlike anyone they had ever heard before. People acknowledged that Christ performed miracles that no mere man could ever perform. The Truth of God as presented by His Son, Jesus the Christ — the promised Messiah (deliverer) — divided what is true from what is false, just as the sun divides the day from the night. Those who hated the Truth sought to denounce and destroy the One whom God sent as THE LAST WORD to mankind. They thought when they had him crucified on the Cross that they had succeeded. Yet Christ arose from the dead and proved they were powerless to overcome the Truth of God. So they attempted to cover up the Truth and sought to have everyone who believed the Truth put to death. The false is still trying to subdue the Truth to this day and finds itself just as powerless as ever. Denying the existence of God will only insure God's wrath on the day of judgment. No one need ever fear the Truth, unless they seek to deny it. The Truth of God is Eternal Life for those who accept it and hold on to it like a drowning man clings to a life preserver. For that is EXACTLY what the Word of God is and does. It preserves the life of those who hold onto it and never let go — no matter what. There was a man sent from God, whose name was John. He came for testimony, to bear witness to the light, that all might believe through him. He was not the light, but came to bear witness to the light. The true light that enlightens every man was coming into the world. He was in the world, and the world was made through him, yet the world knew him not. He came to his own home, and his own people received him not. But to all who received him, who believed in his name, he gave power to become children of God; who were born, not of blood nor of the will of the flesh nor of the will of man, but of God. And the Word became flesh and dwelt among us, full of grace and truth; we have beheld his glory, glory as of the only Son from the Father. For God so loved the world that he gave his only Son, that whoever believes in him should not perish but have eternal life. For God sent the Son into the world, not to condemn the world, but that the world might be saved through him. He who believes in him is not condemned; he who does not believe is condemned already, because he has not believed in the name of the only Son of God. And this is the judgment, that the light has come into the world, and men loved darkness rather than light, because their deeds were evil. For everyone who does evil hates the light, and does not come to the light, lest his deeds should be exposed. But he who does what is true comes to the light, that it may be clearly seen that his deeds have been wrought in God.